Wupatki National Monument - Super Inky! It's time for another post about my trip with Raven! The day after the Grand Canyon, our parents suggested that we take a day to rest. We said "NO WAY!" and off we went to a new National Park. 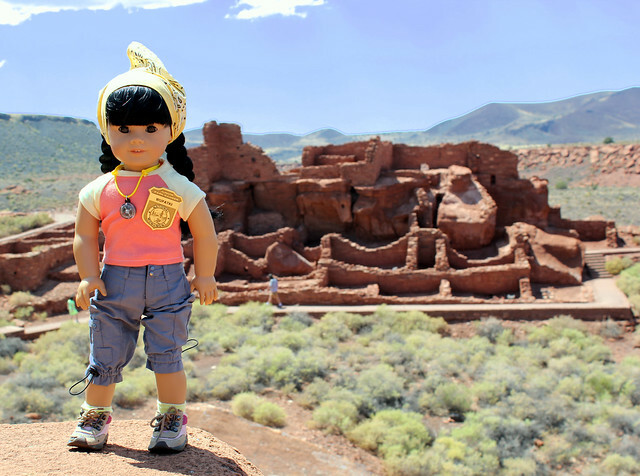 This time, we visited Wupatki National Monument. 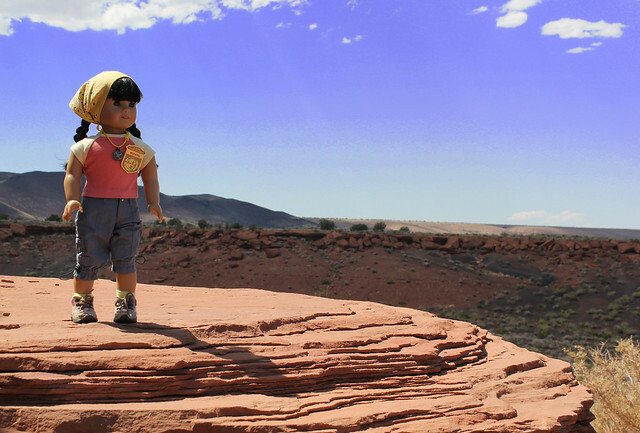 Wupatki is a Pueblo where people no longer live. You can go and see the buildings and ball court, check out the museum, and of course, do the Junior Ranger program. 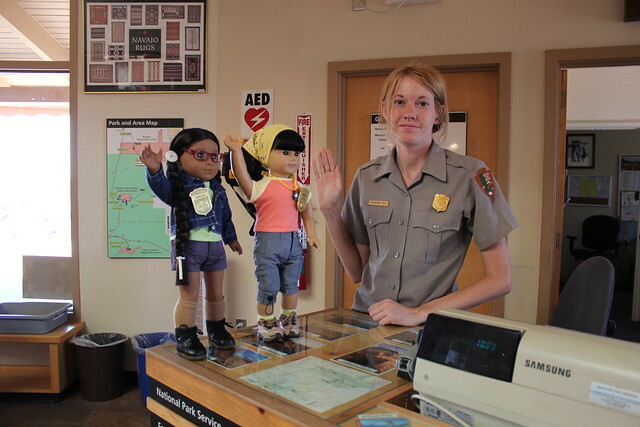 One nice thing about the Junior Ranger program at Wupatki is that you can do it all inside! It gets extremely hot in Arizona, so it was great that we could do the workbook in the comfort of the air conditioned museum. There were lots of interesting questions, including a section where you get to use artifacts to figure out things about the Wupatki people. Once we finished, Ranger Cassandra swore us in! After we earned our badges, we went for a walk around the Pueblo. Here's Raven in a section you can actually enter! You can walk down to the ball court too, but it was too hot and our parents made us sit in the shade and drink water instead. Archaeologists don't know what kind of game was played in the ball court, which is shaped like an oval. 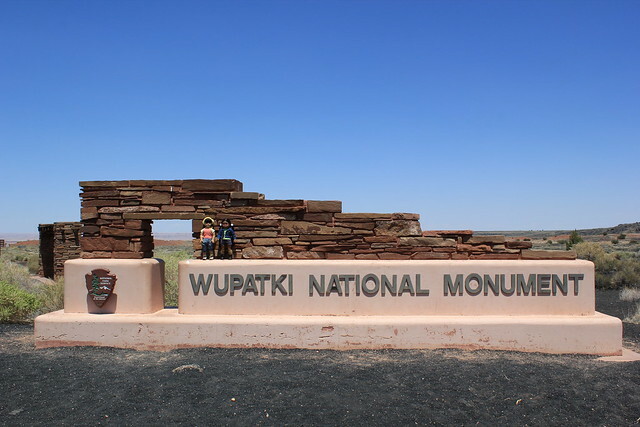 What do you think the Wupatki people played? Another awesome adventure, Inky! How fun! And yaay for Ranger Cassandra for swearing you guys in. Your trips are so fun, and the scenery is amazing! Thanks for sharing your adventures! Hi,I am Marisol and my sister Hailey love looking at your pictures and want to meet you! so post if your ever in texas! :)It looks like you always have fun!!! Hi Marisol and Hailey! We were just in Texas last week, but all we saw was the Dallas/Fort Worth airport. We'll let you know if we get to visit for longer! Wow, you're right - the red rocks and the big, blue sky look beautiful! I'll bet it was even better in person. That sky almost looks indigo, at least in the photo. 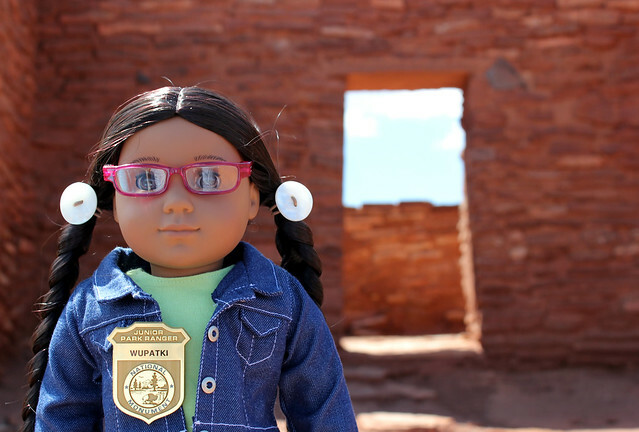 I've been to Colonial Williamsburg, but compared to Wupatki National Monument, that isn't really long ago! Colonial Williamsburg is pretty darn old! I've never gotten to go there, but I'd love to. Wupatki was so beautiful. I hope you and Juliette get the chance to visit it someday. Beautiful pictures! It looks like a really interesting place. I heard you're going to be moving soon- I bet you'll get the chance to visit lots of National Parks near your new home, lucky duck! P.S. Can't wait to hear more about Marigold! I like the homes in the first photo- it's neat to imagine that someone once lived there. I just wanted to say that I enjoy your national park posts. It is nice to see places that were inhabited centuries ago. I have visited the Lascaux Caverns in Montignac, France with my mom and sister, and they were a great sight to see. I think you'd like them. My dream is to visit Spain next summer (hopefully), and since we'll be in the southern part of the country, I want to visit the Alcazaba- it was built in the 11th century by the Moors. You got to go to Lascaux? That is AMAZING! I have always wanted to go there, but I've heard you have to have special permission because people's breath was destroying the paintings. Thank you Spicemuffin! That is so sweet of you! i don't know what park you went through....and i LIVE in Arizona.